Building on arguments to political incomes, career concerns and elitist networks, this study assumes that an increasing percentage of highly incentivized former executive board members within the German Federal Government (1957–2012) will decrease the top earners’ average income tax rate during the subsequent year. Conversely, the percentage of lower incentivized former supervisory board members is assumed to increase the top earners’ average income tax rate. Both effects are assumed to be enforced if the ruling parties have strong support in the German Bundestag. The empirical results significantly confirm the unconditional effect for former executive board members and the conditional effect for former supervisory board members. Corresponding to sociological findings (see Hartmann 2002, Der Mythos von den Leistungseliten. Frankfurt a.M., Campus) and building on Barro’s (1973, The Control of Politicians: An Economic Model. Public Choice 14(1): 19–42) approach to the selfish maximization of political income and arguments regarding career concerns from principal agent theory (see, e. g. Fama 1980, Agency Problems and the Theory of the Firm. 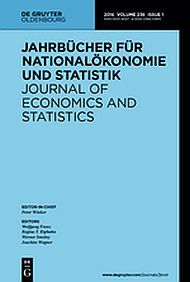 Journal of Political Economy 88, 288–307), this study assumes a strong incentive for former executive board members in the German Federal Government (1957–2012) to maximize their political income by lowering the top earners’ average income tax rate (1958–2013) due to their social elitist homogeneity and career concerns in terms of future job opportunities in business corporations. Conversely, former supervisory board members are assumed to increase the top earners’ average income tax rate due to their differing social backgrounds. Despite possible career concerns, they are assumed to increase the top earners’ average income tax rate in order not to lose their previously gained ideological credibility. Both effects are assumed to be enforced if the ruling parties have more than or equal to 55 % of seats in the German Bundestag. By running OLS and Tobit regressions, the empirical results confirm an unconditional decreasing effect of a higher percentage of previous executive board members and a conditional increasing effect of a higher percentage of previous supervisory board members on the top earners’ average income tax rate.